Most startups underinvest in SEO for a really long time. If that’s you, listen up. On the one hand, I can’t blame you. You’re trying to get a new thing off the ground and just keep it alive, and maybe even grow it. You’re trying to figure out your customer segments, how you’ll make money, who you need to hire and when, and so much more. Trust me, I’ve been through all of it over the last two years running Credo. It’s one of the hardest things you can do, yet incredibly rewarding when it works. But it is hard to focus on traffic when you feel like you need to focus on your business. At the same time, can you really focus on your online business if you have zero or minimal traffic? It’s the SaaS chicken and egg. Many companies have built and/or scaled their business through using solid SEO practices and investing in it. Spencer Rascoff of Zillow says that not investing in SEO earlier is one of the things he regrets most as they’ve built that company. So what SEO advice would I give to new (and scaling) startups? The first bit is not strictly SEO but it matters, then I’ll get into specific areas that startups need to have locked down. I don’t care who you are – if you do not have the best (or a really really really good) product then you’re going to have a bad time in SEO and business. If your customers are not happy and are not willing to tell others about you, if your website looks like it is from 1999 or exactly like your competitor’s, or if you have customers publicly complaining about your service, you’re going to have trouble building a site that people want to link to and then getting people to link to you. Rascoff says that Zillow focused on SEO too late. I actually think they started focusing on it at just the right time. They built a product that people love, figured out their internal operations (as much as any business can), and built a culture set up to build a 100 year company. They built and grew the fire that way, then they poured gas on the fire by focusing on SEO. This allowed them to overtake their main competitor (Trulia) and then eventually acquire them in 2015. So while I definitely think you should do the best practices, don’t come out of the gate thinking that you will just dominate through SEO (because SEO takes time) and have a lackluster product. Otherwise you are just filling a leaky bucket. If you are starting your SaaS app in an established space, then there is already search volume for non-branded keyword terms that your potential customers are using to currently find your competitors. By using tools like Moz’s Keyword Explorer, SEMrush, or AHREFS to find the keywords that your competitors are ranking for. Using a tool like SEMrush, you can plug in your competitors and identify not only the high volume terms they are ranking for but also the CPC (cost per click), which basically tells you how valuable that keyword might be for your business. The higher the CPC the more competitive it is, but that’s because it’s more valuable potentially. Then move on to the next point (and check out our easy keyword research for SEO post). The next major issue I see for startups is not building out your public non-app website (some call it the “marketing site”, but I personally refuse to use that term) to have individual pages targeting the terms you just identified above. I have been on many phone calls with startups where I took a look at their site and showed them that they were ranking at the top of the second page of Google’s search results with their homepage, which was not targeted to the term. Simply by building dedicated pages for these terms, this startup could easily be middle of the first page and optimize from there to rank top 3 for very important keywords for their business. There are many ways to think about building out pages to rank, and obviously you need to start with keyword research. After that, then think about your personas and who your product works best for, then build pages around that. 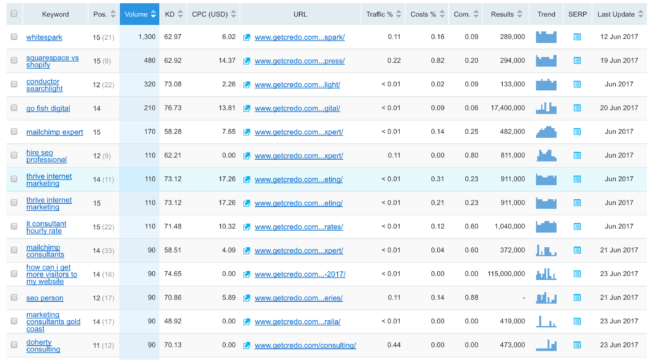 I already mentioned this above, but one of the best ways to do SEO on your SaaS publicly facing website is to identify the keywords that you are ranking #11-15 for, then build out specific pages targeting those terms. Do we have a dedicated page? If not, build it. If so, move to the next point. Does a competitor who is outranking you have more links than you do to your page? How can you build more/better links to get your page ranking better? This is quick low hanging fruit, which I know startups love. Something many startups do not like doing is having a top navigation, out of mostly (in my opinion) misguided and trendy design initiatives. Now, I am definitely a fan of good design and good conversion rates (all the traffic in the world means nothing if you can’t convert it or monetize it!) but it is also possible to go too far to the other side of the spectrum. One of the best ways to fix your site architecture, when your pages are not linked from the homepage or other strong pages at all, is to implement an HTML sitemap on your site. Essentially, this is a page (or set of pages) that lists out all of your pages on the site. Many large websites will divide these up by category/subcategory/product or however the site’s information architecture is structured. The SEO goal is to make all of your page accessible 2-4 clicks off the homepage. This way they are all indexed and have some link equity pointing to them, and at the same time you can prioritize more important pages by linking to them more often internally. XML sitemaps are one of the biggest things I have to fix when I start working with a new client. This is for good reason, because XML sitemaps are hard to create, are finicky when updating URL structures on your site (which happens often in startups), have to be maintained, can be computationally expensive to recompile every 4-12-24 hours, and generally do not feel very important when you have a mound of other things to do to keep your business from just not dying. But, XML sitemaps are incredibly important for SEO even if your site is small and you don’t have much traffic. If you use a CMS like WordPress and Yoast’s SEO plugin, unless you do some quite custom work you’ll have functional sitemaps out of the gate. Then all you have to do is submit them to Google Search Console. Yoast SEO also divides them up into post types and taxonomies, so you can identify if you have indexation issues and then fix those. As you can see, I have some work to do in my own sitemaps! Continuing on from above, if you have a website architecture that is structured according to category/subcategory/products and you link between all of them up and down the architecture, you can target your main keywords to your categories, link to those from your top navigation, and then rely on your internal linking to help the rest of your pages rank. I’ve mentioned links and content a few times through this post, but the best way for startups to get attention and traction is to tell their story. Some of the startups who have done best and grown into good sized companies are companies like Buffer who have told their story as they’ve gone, being radically transparent in good and bad times, and even done things like make their revenue transparent. Other startups like Moz have relied on their founder Rand and senior members to speak at conferences, tell the Moz story (once again they are super transparent), and teach their audience what they need to know about SEO/digital marketing. So figure out what makes your company unique, or how you can uniquely position yourself in the marketplace. Maybe even work with a PR consultant or branding consultant to help you identify the main points of your story so that you can tell them. Telling your founder story can be a great way to get mentions in places like Entrepreneur, Forbes, and more. Don’t just say what you are doing, but also why it matters and why this is the right time and you are the right team. What do you think, startups? What have you done or not done for SEO and how are you going to change moving forward? Great article, i was told that PR doesn’t matter, do you think there’s any truth to that? Martin – it comes down to what metrics you watch as directional vs the ones that actually matter. Traffic matters. Rankings are directional. PageRank exists but we don’t see Toolbar PageRank anymore. PageRank is Google’s ranking algorithm (broad stroke), though it’s way more complicated than that. Fix your site, build links, create awesome content, and win the SEO game.